Tooth extraction is sometimes necessary when a tooth has become severely decayed or damaged. In fact, up to 74% of adults have had to have a tooth extracted at some point in their lives. While not all tooth extractions are the result of tooth decay, approximately 47.2% of adults over the age of 30 have some form of periodontal disease, which can result in a necessary tooth extraction. But once a tooth is extracted, what are your options for replacing it? Dental implants are one of the most popular choices for those looking to replace a missing tooth. These procedures are largely successful and allow patients to experience the look, feel, and function of a real tooth. 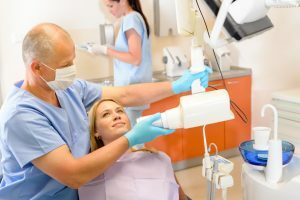 The process involves implanting a titanium root into the jaw, capping it with an abutment, and then capping the abutment with a porcelain tooth crown. For those who may not be able to receive a dental implant due to problems with the jaw bone, mini implants are also an option. Another popular option for replacing a missing tooth is the partial denture. Like other dentures, a partial denture is fixed to the gumline using an adhesive and can be removed for brushing, eating, and dental care. The denture gives you the appearance of a full and healthy smile and can be worn as soon as you heal from your tooth extraction. A dental bridge is essentially a false tooth that is placed in the space of the missing tooth and held secure by two tooth crowns on either side. The crowns are placed over your existing teeth to help keep the false tooth in place for proper functioning. However, for a dental bridge to be an option the teeth on either side of the false tooth need to be healthy or else they won’t be able to support it. A tooth extraction is sometimes necessary if the tooth itself is too severely damaged. However, the good news is there are plenty of options for you to choose from to replace your missing tooth. For more information on cosmetic dental care options, make an appointment with Dr. Derek Wall today.